This year’s fifth issue of Windsock Worldwide has now been released and contains the usual diverse range of subjects. The highlight is undoubtedly Alan Toelle’s expose on Nieuport camouflage of 1916. Those of us that read “Nieuport Flyers of the Lafayette” came across new information regarding the colours of these aircraft. This article is the first of two parts, which explains the reasoning behind this new interpretation. To support the commentary, Ronny Bar contributes an excellent piece of artwork in the form of a five-view image. This Nieuport 11 from Escadrille N.26 graphically illustrates the new information. George Haddow continues his series on Austro-Hungarian Naval aircraft, this time dealing with the Hansa-Brandenburg W18. Apart from a revealing selection of photographs, a 1:72 scale set of the author’s own drawings is included, as well as Bob Pearson’s commendable artwork. Harry Woodman concludes his analysis of the Russian Lebed XII and Reinhard Kastner provides some tantalizing period photographs of the LVG C.V.
RE 8 squadron markings come under the spotlight with Les Rodgers presenting the first of a series on this subject. The piece is also complimented by the artwork of Bob Pearson who contributes three color profiles. Lack of space precluded the review section in the last issue but this returns with a wrap-up of the latest kits and accessories. 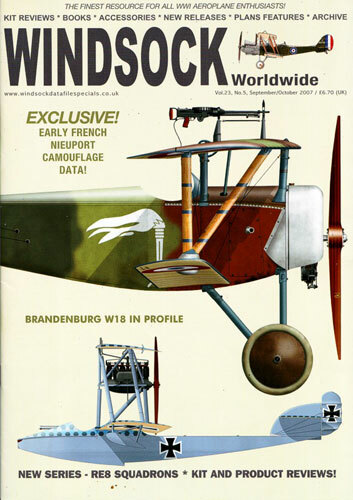 This is another interesting issue and will be welcomed by all World War I aircraft enthusiasts.